Light and tender, this cake is easy enough for casual weeknights, but fancy enough to impress weekend dinner guests. Then there are other recipes that I fall head over heels in love with and bake over and over again. 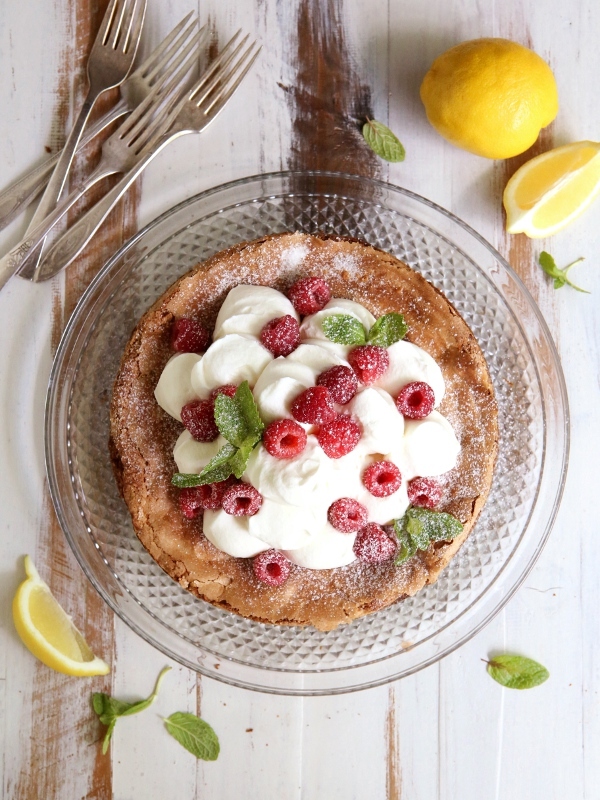 Like this simply dreamy lemon olive oil cake. I first stumbled upon the recipe several years ago as I was planning a little dinner party. I needed an impressive dessert that wasn’t too heavy, but also uncomplicated and not stress-inducing. This cake was such a hit that evening that it’s made many more appearances at parties and potlucks since then. 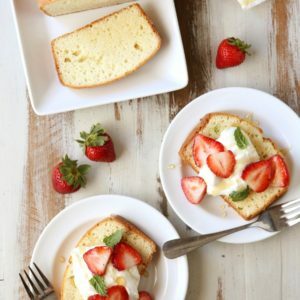 The cake is very tender and moist with subtle lemon and olive oil flavors. The olive oil gives it a certain something that sets is apart and elevates the cake from good to great. 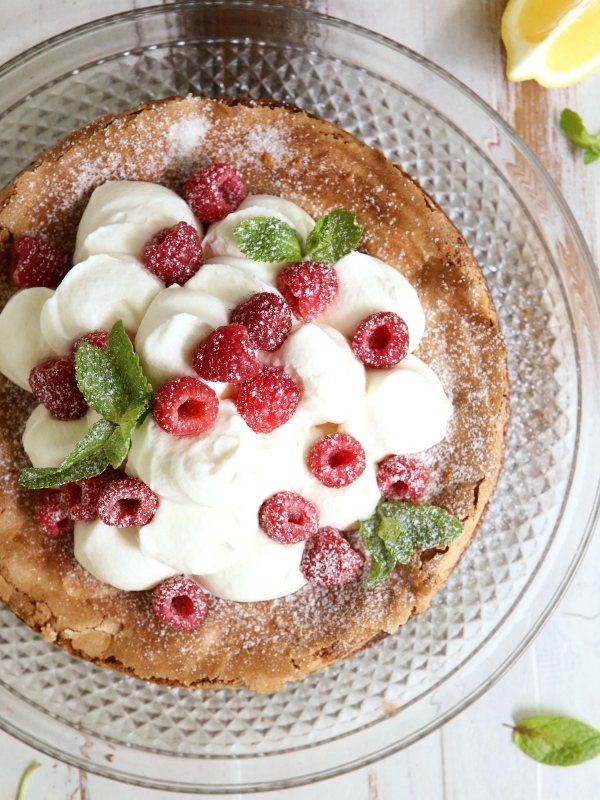 This cake can be served many ways, though my favorite is with sweetened whipped cream and fresh berries. 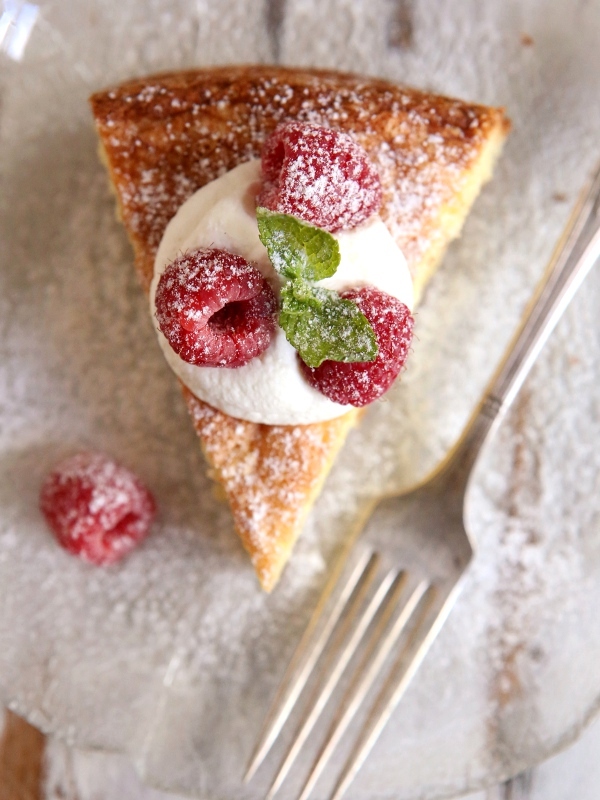 A light and tender lemon-scented olive oil cake. Preheat oven to 350 degrees. Grease a 9-inch springform pan with non-stick cooking spray. Line the bottom with a circle of parchment paper and grease with the non-stick spray. In the bowl of a stand mixer fitted with a wire whisk attachment, whip the egg yolks with 1/2 cup of the sugar until pale and thick. Combine the olive oil and lemon juice and with the mixer running on low, slowly add it to the yolk mixture. It may look slightly curdled. Add the flour and lemon zest and gently fold into the yolk-olive oil mixture with a spatula. In the bowl of the stand mixer fitted with the wire whisk attachment, whip the egg whites until foamy, then slowly add 1/4 cup of the sugar and continue to beat to soft peaks. Gently fold into the olive oil mixture, just barely until incorporated. Do not overmix. Spread into the prepared pan and sprinkle with the remaining 2 tablespoons of sugar. Bake until a toothpick inserted into the center comes out clean, 30-35 minutes. Let cool for 10 minutes, then remove the sides of the springform pan and cool completely. Dust with powdered sugar and serve with whipped cream and fresh berries, or as desired. Note: You can use either extra-virgin or regular olive oil. Extra-virgin olive oil will yield a slightly stronger flavor. Recipe from Gourmet Magazine via Epicurious. Note: Recipe originally published in March 2011. Photos have been updated and recipe has been reworded for clarification. This looks deeevine!! I'm printing and trying ASAP!! :) Thanks! You make such beautiful food…Everyday posts aren't necessary, everything I've baked from your blog has turned out delicious. Thanks for the great recipes! Woww wat a beautiful and gorgeous cake,sooo marvellous..
Wow, this is just perfect. I'm putting it on my list of "TO BAKE ASAP". Thanks for sharing. There are so many varieties of olive oil–what kind do you use? Good question! I can't believe I forgot to mention that. I've now made a note in the recipe. Thanks for bringing it to my attention! Annalise, this cake looks delicious. 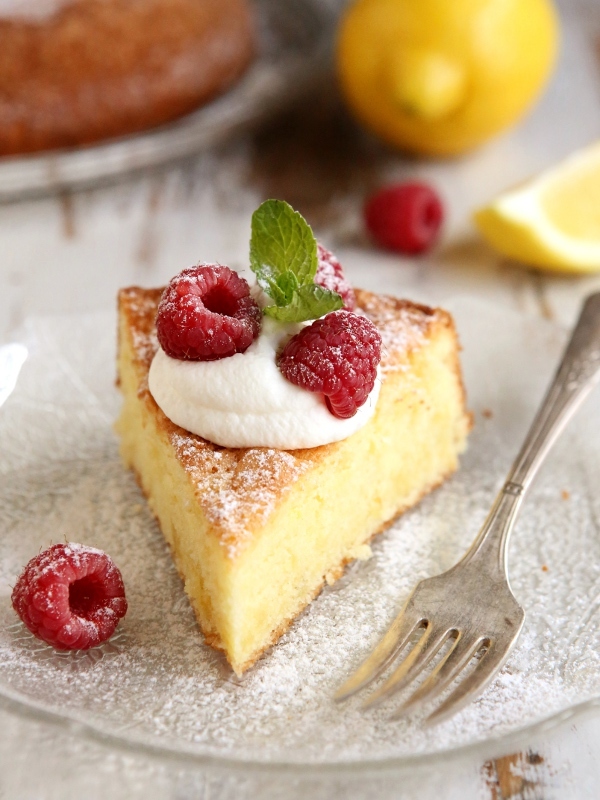 I've been planning on making an olive oil cake also… The lemon is a lovely touch. looks beautiful. I love how crisp the edges got! I have a similar recipe that I absolutely ADORE! I just love cakes like this. They remind me of sitting with my mum of an afternoon with a piping hot cuppa tea! Thanks, just printed it! I will be making this tomorrow, I've got a few Meyer lemons to use up! Sounds perfect! Gorgeous! This looks so yummy…I love lemon and olive oil together. Can't wait to try out this recipe! hmm to be honest I'm not that much for the olive oil… Do you think I can cut that out? I promise, you won't even be able to detect the olive oil in the cake. Give it a try! I would imagine you would be able to swap out the olive oil for vegetable oil, but since I have not tried it myself, I couldn't say for sure. Oh my! Now that is one beautiful looking cake! Fabulous photos!! I have been wanted to try an olive oil cake for a while and this looks so wonderful, crackly exterior and all 🙂 I've been meaning to tell you that I tried your clementine scones and they are fantastic! I've made them so many times with different citrus and they are always great. Thanks for sharing the recipe! Exactly my kind of cake – simple and sweet. Can't wait to try it. This is exactly what I need to eat, right now. When I'm back in my kitchen I am definitely going to try this out. Thanks for the inspiration! This sounds so fresh and looks simply lovely. This looks fantastic! I can't wait to try it out. Quick question – where do you find a 9×5 loaf pan? I have 2 loaf pans from Williams Sonoma – one is just under 9×5 (8.5×4.5) and one is just over(10×5 I think). Most recipes I see call for a 9×5 loaf pan but I can't seem to ever find one to buy. Any thoughts? could I use gluten free flour in this? will the measure stay the same? I have actually never baked with gluten free flour so I can't give you any advice on substituting it here. If you try it, let me know how it goes! Going to make it today for my husband´s birthday! Congratulations on your blog, it´s quite interesting. I live in Spain so we always use Virgen Olive oil for everything, never butter or other kinds of fat. We even make our toasts with olive oil, tomato and a slice of "jamón serrano", this is salted ham (you can find it in Italian stores in America, they call it "prochuto" but it´s the same thing). I love the taste of olive oil, sometimes we just pour some over boiled pasta with a little garlic; delicious!! I´m sure this cake will be great. I´ll let you know. Another thing: love your photographs!!! I just shared this recipe on Facebook from our axiomia.biz page. Thanks! 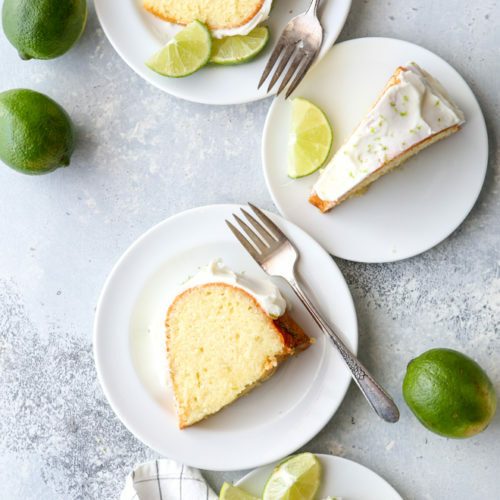 This cake really showcases the lemon taste and great texture when the olive oil is made from Picual olives. Picual and lemon are a heavenly combo. It looks delicious! How long do you think it would last? Do you think I could take it camping? Well honestly we always eat it too quickly to know if it keeps well! But it has lasted a few days on the counter, covered, just fine. And I'd say, sure, take it camping! It's not super sturdy but if it's packed well it should hold up. And crumbly cake is still delicious too. Really excellent! Light, pretty lemony yellow, no olive taste to speak of. And quick to boot! Wondering why you use all-purpose flour; did you like the results better than cake flour? This is exactly what I was looking for! thank you. This is my type of blog so I have added you to mine! Awesomeness!! Yes, just make sure you grease and flour it well. this cake is soooo delicious! I made it last week and brought it into the office and it was a huge hit! I just made this cake, and it’s absolutely delicious! 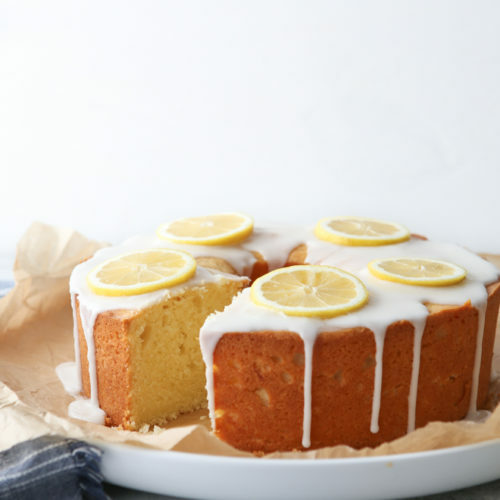 Super moist, sweet and subtle flavor of lemon, great tangy addition with the glaze…. I will totaly bake this again sometime (soon! ), and next time I think I’ll skip the « sprinkle with sugar » part. It added a little something too sugary for my taste, so I’ll simply use the lemon glaze. Now it’s sitting on my counter top, screaming my name for me to have a… third piece. Try to resist. Not easy. Loved the cake so much I made one yesterday and one today. Considering am a huge bakophobic….. did not bother with the glaze the first time round, still thinking about glazing today’s effort. I have some fresh Meyer Lemons begging for a recipe. I think they just found their match. Looove that crust. Oh my, this looks delicious! 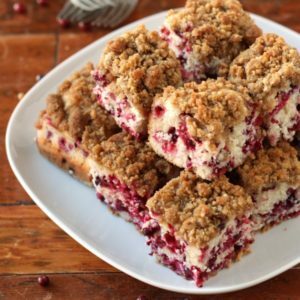 I just “found” your blog today and have spent quite a lot of time drooling over your recipes (and pictures!). 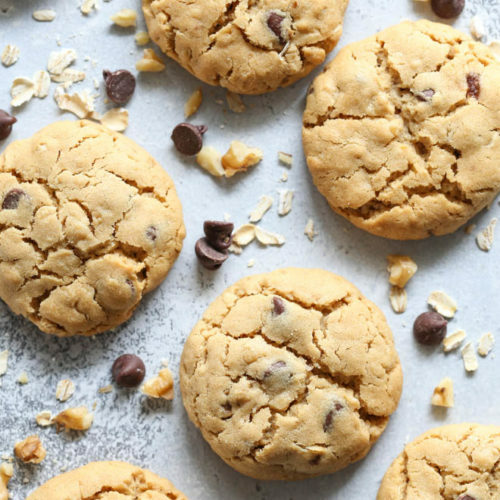 I was resolved to making the brown butter chocolate chips because that sounds a-mazing but discovered I was all out of chocolate chips- who does that?! Anywho, this looks equally delicious and I am now off to make it! Thank you for taking the time to share your wonderful creations! I made this cake the other day, and it turned out delicious. I want to make it again, but I was wondering if I could use a liqueur like Grand Marnier in the cake. If so, how much and where should I add it? I’m making this cake for a special occasion, even though I have made it several times before and know it is a simpler kind of thing–because all of the food at the baby shower will be mediterranean and I wanted to push that. It has to serve 50, so I’ve made two big layers (4x the recipe). The cake is perfect… but it is supposed to have frosting of some kind. Classic buttercream just doesn’t seem right. Any advice? This would be perfect for a Mediterranean food themed shower! And it’s one of my favorites. Are you going to make the layers into a layer cake? I’m not sure how it would hold up as a layer cake since it is so delicate, you’ll have to let me know. Maybe you could frost it with an Italian meringue buttercream? It’s light and elegant. I have a how-to here. thanks for your response, annalise. the recipe you offer is what i always think of as “true buttercream,” and i have also used it to ice wedding cakes–it is perfect, and every baker should master it. your photos of the process are beautiful. for the olive oil cakes, i couldn’t convince myself to use a buttery icing, and i didn’t want to make supports to layer it (which, as you would guess, it would absolutely have needed, because of how light a cake it is). i laid the three large layers out on a long, rustic board and dusted them each with powdered sugar. before serving, i covered the top of two with mascerated strawberries (some people are allergic to strawberries, but they should still get to eat the cake!). Sounds like a fantastic presentation, I bet everyone loved it! Bula Annalise, I’m John from Fiji all the way from the South Pacific! I discovered your recipe and wanted to give it a try! I guess it ain’t hard for guys to try it out! I’ve just put my cake into the oven hoping it turns out! Have yet to taste it! Thanks for the easy to do recipe! Thanks for the great recipe! I love that it uses olive oil rather than a more unhealthy oil choice. It’s baking right now, can’t wait to try it! * Just as a side note: I always add 1 Tbsp. cold water per egg white when I beat egg whites, it helps to stiffen the egg whites much quicker. Hi! I stumbled upon your yummy-looking cake while searching for an olive oil cake. Quick question: can I add baking powder or will it be a disaster when I try to pour the glaze? I haven’t tried the recipe with baking powder, so I can’t testify as to the results. However, baking powder is not needed to make this cake rise. It gets its rise from the whipped eggs. Have to say; you destroyed me! I baked three of these in the past few days and gained 2 pounds 🙂 I added baking powder in one of them and there was no difference really, so you were right. I loved the texture from the whipped eggs. Genius recipe, thank you! The chocolate cake was amazing, but the apple and pear one was a bit disappointing, mainly because I’m not that keen on cinnamon. The idea is good, sandwiching fruit between two layers of cake, so I’m going to experiment with different flavours for the cake and see if all those raising agents are necessary. looks scrumptious! but the picture that posts when I share on facebook looks more like a bread and does not look like any of the above pictures of this cake! so sad, cuz the one that posts is NOT as appealing to look at! Thank you for this wonderful recipe! It was easy to make, the cake was LOVELY! Smooth texture, fragrant and delish! 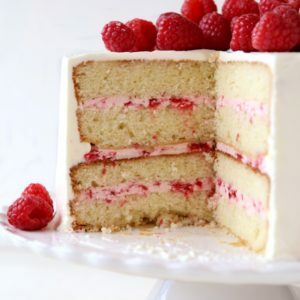 This cake is so pretty, love the whipped cream and berry topping! I don’t have a spring for pan. Can I just use a regular round cake pan? I would love to make this tonight. It looks so refreshing! Hi Lisa! Yes, you can use a regular round cake pan. Just be careful as you remove it from the pan as this cake is quite fragile. Great! Thank you for the quick reply! I can’t wait to taste it! Hello, Can i use Meyer lemons for this recipe? I baked this cake this evening and really enjoyed it. Thanks for sharing. Thanks for sharing this recipe. Just wanted to confirm. This cake doesn’t have any baking soda or baking powder? Yep! It gets its leavening from the whipped eggs. Do you ever make gluten-free foods? Sorry, I don’t have experience with gluten-free baking. But there are plenty of other online resources out there! Just made this for Easter and it was amazing! 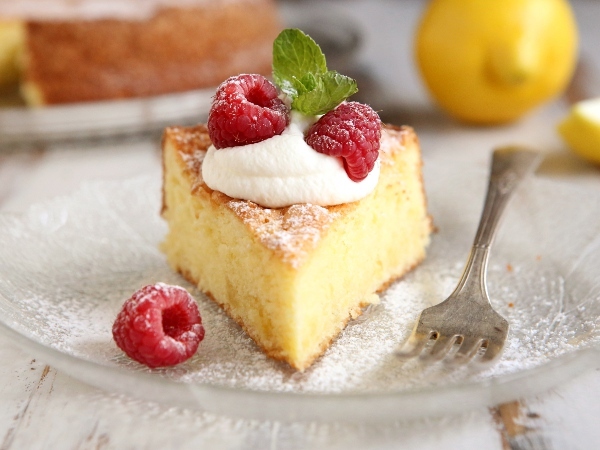 Super light and fluffy with the perfect balance of lemon and sweet. Everyone loved it! Thanks, it’s one of my faves! I’m going to make this cake today for Mother’s Day! I made your Southern Coconut Cake several times, huge hit and your tips were appreciated! I’ve also made your Chocolate Fudge Cake, delicious as well! Does this cake freeze well? I would like to make it ahead of time. What a beautiful cake with a fine tender crumb. I let my husband choose the flavor for a cake for our anniversary. Choices were chocolate or lemon; I knew which he would pick. 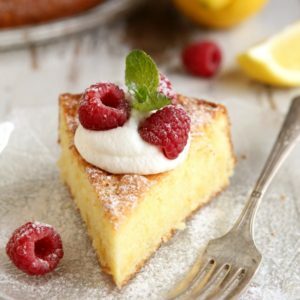 I watched a TV show recently that featured a lemon – olive oil cake so I was eager to try it. I found this recipe and selected it because it was a single layer. I hit the jackpot. Thanks for a wonderful recipe, and by the way, thanks too, for writing the recipe in weights. Thanks so much for the feedback! This is one of my favorite recipes, so happy you enjoyed it!